Gasoline and electricity have made possible the modern automobile. Each has its work to do in the operation of the car, and if either fails to perform its duties, the car cannot move. The action of the gasoline, and the mechanisms that control it are comparatively simple, and easily understood, because gasoline is something definite which we can see and feel, and which can be weighed, or measured in gallons. Electricity, on the other hand, is invisible, cannot be poured into cans or tanks, has no odor, and, therefore, nobody knows just what it is. We can only study the effects of electricity, and the wires, coils, and similar apparatus in which it is present. It is for this reason that an air of mystery surrounds electrical things, especially to the man who has not made a special study of the subject. Without electricity, there would be no gasoline engine, because gasoline itself cannot cause the engine to operate. It is only when the electrical spark explodes or "ignites" the mixture of gasoline and air which has been drawn into the engine. cylinders that the engine develops power. Thus an electrical ignition system has always been an essential part of every gasoline automobile. The first step in the use of electricity on the automobile, in addition to the ignition system, consisted in the installation of an electric lighting system to replace the inconvenient oil or gas lamps which were satisfactory as far as the light they gave was concerned, but which had the disadvantage of requiring the driver to leave his seat, and light each lamp separately, often in a strong wind or rain which consumed many matches, time, and frequently spoiled his temper for the remainder of the evening. Electric lamps have none of these disadvantages. They can be controlled from the driver's seat, can be turned on or off by merely turning or pushing a switch-button, are not affected by wind or rain, do not smoke up the lenses, and do not send a stream of unpleasant odors back to the passengers. The apparatus used to supply the electricity for the lamps consisted of a generator, or a "storage" battery, or both. The generator alone had the disadvantage that the lamps could be used only while the engine was running. The battery, on the other hand, furnished light at all times, but had to be removed from the car frequently, and "charged." With both the generator and battery, the lights could be turned on whether the engine was running or not, and, furthermore, it was no longer necessary to remove the battery to "charge," or put new life into it. With a generator and storage battery, moreover, a reliable source of electricity for ignition was provided, and so we find dry batteries and magnetos being discarded in a great many automobiles and "battery ignition" systems substituted. The development of electric lighting systems increased the popularity of the automobile, but the motor car still had a great drawback-cranking. Owing to the peculiar features of a gasoline engine, it must first be put in motion by some external power before it will begin to operate under its own power. This made it necessary for the driver to "crank" the engine, or start it moving, by means of a handle attached to the engine shaft. Cranking a large engine is difficult, especially if it is cold, and often results in tired muscles, and soiled clothes and tempers. It also made it impossible for the average woman to drive a car because she did not have the strength necessary to "crank" an engine. The next step in the perfection of the automobile was naturally the development of an automatic device to crank the engine, and thus make the driving of a car a pleasure rather than a task. We find, therefore, that in 1912, "self-starters" began to be used. These were not all electrical, some used tanks of compressed air, others acetylene, and various mechanical devices, such as the spring starters. The electrical starters, however, proved their superiority immediately, and filled such a long felt want that all the various makes of automobiles now have electric starters. The present day motor car, therefore, uses gasoline for the engine only, but uses electricity for ignition, starting, lighting, for the horn, cigar lighters, hand warmers on the steering wheel, gasoline vaporizers, and even for shifting speed changing gears, and for the brakes. On any car that uses an electric lighting and starting system, there are two sources of electricity, the generator and the battery, These must furnish the power for the starting, or "cranking" motor, the ignition, the lights, the horn, and the other devices. The demands made upon the generator are comparatively light and simple, and no severe work is done by it. The battery, on the other hand is called upon to give a much more severe service, that of furnishing the power to crank the engine. it must also perform all the duties of the generator when the engine is not running, since a generator must be in motion in order to produce electricity. A generator is made of iron, copper, carbon, and insulation. These are all solid substances which can easily be built in any size or shape, and which undergo very little change as parts of the generator. The battery is made mainly of lead, lead compounds, water and sulphuric acid. Here we have liquids as well as solids, which produce electricity by changes in their composition, resulting in complicated chemical as well as electrical actions. 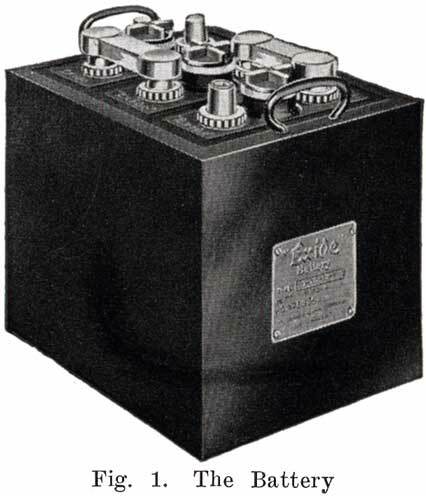 The battery is, because of its construction and performance, a much abused, neglected piece of apparatus which is but partly understood, even by many electrical experts, for to understand it thoroughly requires a study of chemistry as well as of electricity. Knowledge of the construction and action of a storage battery is not enough to make anyone an expert battery man. He must also know how to regulate the operating conditions so as to obtain the best service from the battery, and he must be able to make complete repairs on any battery no matter what its condition may be.